Despite the fact that it is the second largest exporter in the world, the United States is also the only major exporter that has consistently run overall goods trade deficits for more than two decades. More puzzling is the fact that the United States ran a significant trade deficit even in its top 30 exporting industries in 2013. This finding stands in stark contrast to the export performance of industries from other high-exporting nations, all of which generated significant trade surpluses in most or all of the top exporting industries in that year. This issue brief compares trade in goods exports, goods imports, and import penetration (the ratio of imports to exports) for the United States and its top three international competitors: China, Germany, and Japan. Overall, the United States had a trade deficit of $67.4 billion in those top 30 exporting industries. The top 30 exporting industries in those other countries had sizeable trade surpluses that ranged from $223.2 billion in Japan to $285.3 billion in Germany to $647.7 billion in China. The smaller the ratio of imports to exports, the more closed an economy is. The brief finds that China was the most closed of the four markets studied, measured by the ratio of the value of imports to the value of exports (import/export ratio) in its top 30 export industries. With few exceptions, the Japanese market was also highly closed to imports in its top 30 exporting industries. The German market was somewhat more open to imports in its top 30 exporting industries than China or Japan. In its top 30 export industries, the United States was far and away the most open of the four markets studied in this report. The United States differed from the other three countries in this study in another important way. Without exception, the top 30 export industries in China, Japan, and Germany were all manufacturing industries. Six of the top 30 U.S. export industries were primary commodity exporters including grains, seeds, nuts, and crude or refined energy products. China was the most closed in its top 30 export industries. Overall, exports exceeded imports in these industries by more than four to one. The average import/export ratio for China’s top 30 exporting industries was only 23.0 percent. China had a trade surplus in every one of its top 30 exporting industries. These industries were responsible for 38.1 percent of China’s total exports, but only 9.9 percent of its total imports. These 30 industries generated an overall trade surplus of $647.7 billion, which was 250.1 percent of China’s total reported goods trade surplus of $259.0 billion in 2013. With few exceptions, the Japanese market was also highly closed to imports in its top 30 exporting industries. Overall, exports exceeded imports by nearly three to one, and the average import/export ratio for Japan’s top 30 exporting industries was only 35.4 percent. Japan had a trade surplus in 27 of these 30 industries. In one industry, electric parts for telephones and telegraphy, Japan appears to have largely outsourced production, and imports exceeded exports by nearly seven to one. Overall, these 30 industries were responsible for 48.3 percent of Japan’s total exports and 14.7 percent of its total imports. Japan had a $223.2 billion trade surplus in these 30 industries, despite running an overall goods trade deficit of $118.1 billion in 2013. Japan is expected to return to having trade surplus following the 35 percent devaluation of the yen since the fourth quarter of 2011 (Scott 2015, Figure A). The German market was somewhat more open to imports in its top 30 exporting industries than China or Japan. In total, in these industries, exports exceeded imports by a ratio of 1.9-to-1, and on average import penetration rate in the top 30 German exporting industries was 52.6 percent. However, Germany had a trade surplus in 29 of its top 30 export sectors, with the lone exception also being electric parts for telephones and telegraphy (a similar trade deficit in electric parts for telephones and telegraphy occurred in Japan). Not coincidentally, this industry was the top exporter in China and generated the largest trade surplus ($128.0 billion) among all of China’s top 30 leading exporting industries. Overall, the top 30 export industries in Germany were responsible for 41.3 percent of Germany’s total exports and 26.5 percent of its total imports. Germany had a $285.3 billion trade surplus in these 30 industries, and they accounted for 108.0 percent of Germany’s total goods trade surplus in 2013. The United States was far and away the most open of the four markets in its top 30 export industries. Overall, exports averaged only 91.5 percent of imports in these industries—in other words, imports exceeded exports by 9.5 percent in these top 30 U.S. exporting industries. The United States had a trade surplus in only 17 of its top 30 exporting industries. The top 30 U.S. export industries were responsible for 45.0 percent of total U.S. goods exports (similar to the other countries studied in this report), but they were also responsible for 33.4 percent of total U.S. imports. Note that total U.S. goods imports exceeded total exports for all industries by 47.5 percent. Therefore, 45.0 percent of total U.S. exports ($709.8 billion) was less than 33.4 percent of total U.S. goods exports ($777.2 billion), which helps to explain why the United States had a net trade deficit in its top 30 goods exporting industries. These 30 industries generated an overall trade deficit of $67.4 billion, which was 9.0 percent of the total U.S. reported goods trade deficit of $750.3 billion in 2013. The nature of U.S. exports also differed significantly from exports of the other three countries in this study. Without exception, the top 30 export industries in China, Japan, and Germany were all manufacturing industries. Six of the top 30 U.S. export industries were primary commodity exporters including grains, seeds, and nuts. This commodities sector was responsible for a trade surplus of $69.7 billion. The United States also had a trade surplus in aircraft and parts (two sectors) of $76.2 billion. However, these surpluses were more than offset by trade deficits in two other sectors, motor vehicles and parts, with a trade deficit of $117.2 billion, and electronics, with a trade deficit of $110.2 billion, both important U.S. manufacturing industries. The U.S. trade deficit in its top 30 export industries is a consequence of its toleration of massive currency manipulation over many years by China, Japan, and about 20 other countries, the failure to eliminate widespread tariff and nontariff barriers to U.S. exports, and the failure to develop effective strategies for rebuilding U.S. manufacturing. The following tables and figures provide the data that lead to these findings. Figure A reports average import/export ratios (import penetration rates) across the top 30 exporting industries for each of the four countries in the study. The averages ranged from lows of 23.0 percent for China and 35.4 percent for Japan to 52.6 percent for Germany and 109.5 percent for the United States. Estimates represent averages of total exports and imports in the top 30 exporting industries (industry details reported below). The United States is the largest import market in the world (International Monetary Fund 2015). For each country, the top 30 exporting industries were determined by examining the top U.S. imports from each country for each four-digit Harmonized System (HS)1 product category (total export data were only available from the United Nations in HS format (UN Comtrade 2015)).2 For each country, total exports and imports were collected for the top 30 sectors, and also for all four-digit steel industry sectors (HS 72 and 73), since China is the world’s largest steel producer and exporter. For each country, the top 30 exporting industries were identified from this combined dataset. The HS product categories are relatively narrow, as shown in the tables below. They are grouped into major sectors (such as electronics, and motor vehicles and parts) in the country analyses below. Figure B reports total exports, imports, and trade balance across the top 30 export sectors for the four countries in the study. Exports exceeded imports by more than four to one in China, resulting in a huge $647.7 billion trade surplus in just these 30 industries. For Japan, exports exceeded imports in the top 30 industries by nearly three to one, resulting in a trade surplus of $223.2 billion in these 30 industries alone. For Germany, exports in the top 30 industries exceeded imports by nearly two to one, resulting in a total top 30 trade surplus of $285.3 billion. However, for the United States, total exports in the top 30 industries ($709.8 billion) were exceeded by total imports of $777.2 billion, resulting in a trade deficit of $67.4 billion in these top 30 industries. Top exporting industries for China are shown in Table 1, which reports total values of exports, imports, the trade balance, and the import ratio for each industry. Six of the top 10 and eight of China’s top 30 industries in 2013 were in the electronics sector.3 These eight electronics sector industries were responsible for $475.3 billion or 56.5 percent of the total exports in the top 30 industries, and $337.5 billion or 52.1 percent of the total trade surplus of China’s top 30 export industries in that year. Among all other industries, only leather and footwear (four industries) and steel products (three industries) appear more than two times in China’s top 30 list. These findings confirm China’s concentration in high tech products, and especially in computer and electronic parts industries. That sector alone was responsible for 56.0 percent of the $240.1 billion increase in the U.S. goods trade deficit with China between 2001 and 2013 (Scott 2014a). Overall, the top 30 exporting industries in China were responsible for 38.1 percent of total exports, 9.9 percent of total imports, and 250.1 percent of China’s total reported trade surplus for 2013, with an overall import/export ratio of 23.0 percent. These 30 industries represented the core of China’s export powerhouse. Note: All of the tables referenced in the text are available at the end of this report, before the endnotes and references. Top exporting industries for Japan are shown in Table 2. Japanese export industries exhibit greater diversification than China. No broad sector is represented more than three times in the top 10 (electronics and machinery each appearing three times). Overall, four broad sectors are represented five or more times in the top 30 list. However, when weighted by trade flows, the motor vehicles and parts sector (represented by seven industries) dominates the top 30 list, with $153.7 billion in total exports (44.5 percent of top 30 exports), $23.5 billion in total imports (19.3 percent) and a trade surplus of $130.2 billion, more than half, or 58.3 percent of the total top 30 trade balance.4 No other sector has a total trade surplus near that level; machinery, with its five industries, has a trade surplus of just $29.7 billion, followed by steel products (five industries) with a trade surplus of $23.5 billion, and electronics (seven industries, including printing) with a trade surplus of only $5.3 billion (electronics had exports of $68.0 billion and imports of $62.8 billion). Japan has outsourced a substantial share of electronics production.5 Overall, the top 30 exporting industries in Japan were responsible for 48.3 percent of total exports, 14.7 percent of total imports, and had a trade surplus of $223.2 billion, which reduced Japan’s overall goods trade deficit in 2013 to $118.1 billion. These 30 industries also represented the core of Japan’s leading export industries. Top exporting industries for Germany are shown in Table 3. German industry exhibits a pattern of diversification that is similar to Japan’s. Three broad sectors are represented frequently in the top 30: motor vehicles and parts (five industries), instruments (four industries), and machinery (eight industries).6 However, the similarities are even stronger at the level of overall trade flows. When weighted by trade flows, the motor vehicles and parts sector (represented by five industries) dominates the top 30 list, with $242.0 billion in total exports (40.2 percent of the top 30 exports), $90.3 billion in total imports (28.5 percent of the top 30 imports) and a trade surplus of $151.6 billion, more than half, or 53.1 percent of the total top 30 trade balance. No other broad sector comes close; machinery, with eight industries, has the next highest total trade surplus, of $48.3 billion. Instruments, with four industries, has the next largest trade surplus, of $17.9 billion. Overall, the top 30 exporting industries in Germany were responsible for 41.3 percent of Germany’s total exports, 26.5 percent of total imports, and had a trade surplus of $285.3 billion, which was 108 percent of Germany’s overall goods trade surplus in 2013. Without the effect of its trade surplus in these 30 industries (out of the 847 sectors in which it exported products to the United States), Germany would have run an overall goods trade deficit with the world in 2013. These 30 industries clearly represented the core of Germany’s leading export industries. Thus, comparing the export profiles of China, Japan, and Germany, each displays strong export performance in a relatively small number (30 or fewer) top exporting industries. Each generates a large share of its top 30 (and overall) trade surplus in just one major sector (electronics in China, motor vehicles and parts in Japan and Germany). And in each country, in the top 30 industries, exports substantially exceed imports: by nearly two to one in Germany to more than four to one in China. These are the revealed patterns of industrial concentration in countries that are highly competitive in world export markets. 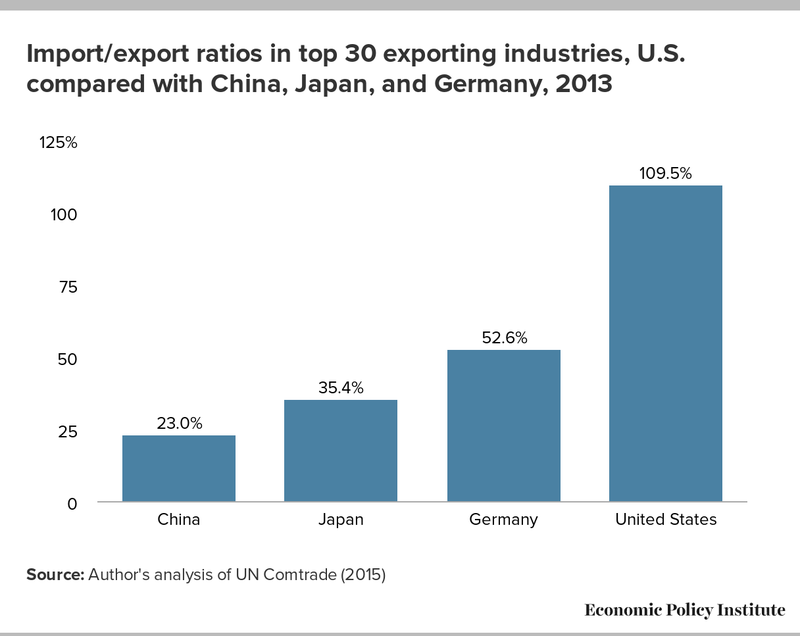 There are a number of factors that explain the relatively poor trade performance of top U.S. export industries. First, currency manipulation by a number of countries, including China and Japan, but also about 20 others, has increased the U.S. trade deficit by between $200 billion and $500 billion, costing between 2.3 million and 5.8 million U.S. jobs (Scott 2014b). The failure of the United States to develop an effective strategy for stopping or offsetting the effects of currency manipulation is a major contributor to the comparatively weak performance of U.S. exporters. Second, the failure to develop an effective strategy for manufacturing development and the promotion of U.S. manufactured exports is a striking failure in comparison to the efforts of the other major export economies studied here. Despite the prominence of commodities such as food and fuel products in the top 30 U.S. export sectors, in total, manufacturing industries were responsible for more than five-sixths (85.5 percent) of total U.S. domestic goods exports in 2013, as they have been in every year since 1997 (USITC 2015). Third, tariff and nontariff barriers to U.S. exports, especially in China and Japan, are a major impediment to the growth of U.S. exports. Finally, the absence of an effective strategy for rebuilding U.S. manufacturing has allowed manufacturers in many countries, including those studied here, to catch up and surpass the performance of U.S. manufacturers in many industries. Japan spends roughly 23 times as much as the United States (as a share of gross domestic product) on manufacturing extension services. Germany, a country with a GDP less than one-fourth that of the United States (21.7 percent of U.S. GDP in 2013) spends approximately $2.4 billion on manufacturing research and outreach. A similar program in the United States (the Hollings Manufacturing Extension program) is funded at less than 10 percent of that level, and has frequently been targeted for elimination in the Congressional budget process. It is disturbing that U.S. policymakers stand idly by and allow U.S. manufacturing to lose out to international competitors by (Scott, Jorgenson, and Hall 2013, 18–20). Robert E. Scott is director of trade and manufacturing policy research at the Economic Policy Institute. He joined EPI as an international economist in 1996. Before that, he was an assistant professor with the College of Business and Management at the University of Maryland at College Park. His areas of research include international economics and trade agreements and their impacts on working people in the United States and other countries, the economic impacts of foreign investment, and the macroeconomic effects of trade and capital flows. He has a Ph.D. in economics from the University of California-Berkeley. The author thanks Ross Eisenbrey and Josh Bivens for comments, and William Kimball for research assistance. Trunks, suitcases, camera cases, handbags, etc. Lamps and lighting fittings, illuminated signs, etc. Electric equipment with heating element, domestic, etc. Faucets, stopcocks, valves for pipes, tanks, boilers, etc. Other toys, scale models, puzzles, etc. Note: Sectors include electronics (e), leather footwear (lf), and steel (s). The abbreviation "nes" in industry descriptions refers to "not elsewhere specified." Sector and overall totals in the text may vary slightly due to rounding. Instruments etc. for medical, surgical, dental, etc. Parts of aircraft, spacecraft, etc. Note: Sectors include motor vehicles and parts (mp), machinery (m), steel (s), and electronics (e). The abbreviation "nes" in industry descriptions refers to "not elsewhere specified." Sector and overall totals in the text may vary slightly due to rounding. Note: Sectors include motor vehicles and parts (mp), instruments (i), and machinery (m). The abbreviation "nes" in industry descriptions refers to "not elsewhere specified." Sector and overall totals in the text may vary slightly due to rounding. Instruments, etc. for medical, surgical, dental, etc. Air, vacuum pumps, compressors, ventilating fans, etc. Note: Sectors include aircraft and parts (ap), motor vehicles and parts (mp), electronics (e), and commoditites (c). The abbreviation "nes" in industry descriptions refers to "not elsewhere specified." Sector and overall totals in the text may vary slightly due to rounding. 1. The Harmonized System is an internationally standardized numerical method of classifying traded products (Export.gov 2015). 2. The U.S. reported imports in 713 four-digit HS industries from Japan, 847 industries from Germany, and 982 industries from China (USITC 2015). In addition, the U.S. reported positive exports in 1206 four-digit HS industries. For each country, the top 30 U.S. import industries were selected as described in the text, and data for total exports and imports in each sector were obtained from the UN Comtrade (2015) database. Data limits in Comtrade precluded downloading more trade data for more than 500 observations for any one country. 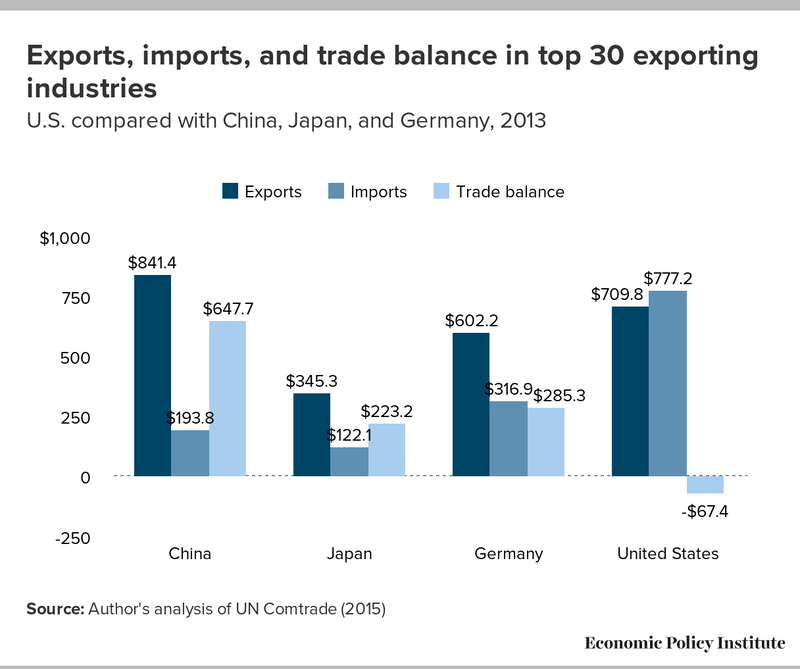 Hence, U.S. imports were used as a proxy for identifying top exporting industries for China, Japan, and Germany. 3. Printing and ancillary machinery (HS 8443) was categorized with the electronics sector for this analysis. For this analysis, the electronics sector also included HS industries 8517, 8471, 8473, 8504, 8528, 8525, and 8518. 4. HS industries included in the motor vehicles and parts sector for this analysis were 8703, 8708, 8409, 8414, 8408, 8407 and 8511. Tires are excluded from the Japanese motor vehicles sector. This industry generated $7.3 billion in exports and a trade surplus of $6.1 billion in 2013. 5. The machinery industries in Japan included in the top 30 exporting sectors were HS 8486, 8429, 8536, 8481, and 8413; top 30 steel industries included 7208, 7225, 7304, 7210 and 7204; the electronics sector included HS 8542, 8443, 8541, 8525, 8483, 8504, and 8517. 6. Among Germany’s top 30 exporting industries, the motor vehicles and parts sector included industries coded as HS 8703, 8708, 8409, 8483, and 8701; the instrument sector included HS 9018, 9031, 9027 and 9022; and the machinery sector included HS 8479, 8481, 8421, 8413, 8414, 8422, 8477 and 8431. 7. For the United States, the aircraft industry included HS 88 and 8411; the commodity industries included HS 7108, 1201, 2701, 1001, 802, and 1005. 8. For example, in 2013, in the seven top HS motor vehicles and parts sectors shown for Japan, the United States had total global exports of $128.7 billion, total imports of $248.4 billion and a trade deficit of $119.7 billion (USITC 2015). International Monetary Fund. 2015. International Financial Statistics. Washington, D.C.: International Monetary Fund. CD Rom. Scott, Robert E. 2014a. China Trade, Outsourcing and Jobs: Growing U.S. Trade Deficit with China Cost 3.2 Million Jobs between 2001 and 2013, with Job Losses in Every State. Economic Policy Institute Briefing Paper 385. Scott, Robert E. 2014b. Stop Currency Manipulation and Create Millions of Jobs: with Gains across States and Congressional Districts. Economic Policy Institute Briefing Paper 372. Scott, Robert E. 2015. Currency Manipulation and the 866,000 U.S. Jobs Lost Due to the U.S. Japan Trade Deficit. Economic Policy Institute Briefing Paper 387. Scott, Robert E., Helene Jorgenson, and Doug Hall. 2013. Reducing U.S. Trade Deficits Will Generate a Manufacturing-based Recovery for the United States and Ohio: Ending Currency Manipulation by China and Others Is the Place to Start. Economic Policy Institute Briefing Paper 351. UN Comtrade. 2015. United Nations Commodity Trade Statistics Database. Spreadsheet downloaded February 13. U.S. International Trade Commission (USITC). USITC Interactive Tariff and Trade DataWeb [Excel files]. 2015.